Psychosurgery is a subset of Neurosurgery (surgery of the brain) intended to modulate the performance of the brain, and thus effect changes in cognition, with the intent to treat or alleviate severe mental illness. It was originally thought that by severing the nerves that give power to ideas you would achieve the desirable result of a loss of affect and an emotional flattening which would diminish creativity and imagination; the idea being that those are the human characteristics that are disturbed. 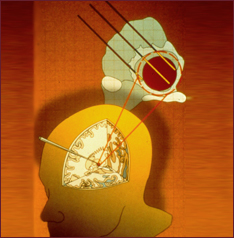 In modern neurosurgery however, more minimally invasive techniques like gamma knife irradiation and foremost deep brain stimulation have arisen as novel tools for psychosurgery. Despite therapeutic progress in recent years, conventional treatment of anxiety disorders fails or has only a temporary effect in 20 percent of patients. These disorders are often severely disabling and are associated with rates of suicide comparable to those of depression. First described by Leksell, psychosurgery targeting the frontolimbic connections in both anterior internal capsules (capsulotomy) is a valuable therapeutic method for selected severe cases. 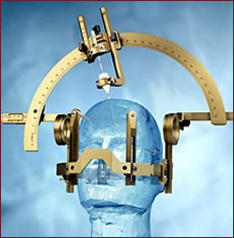 The first cases using the Gamma Knife to create the lesions were also performed by Leksell. Subcaudate tractotomy was introduced by Knight in Great Britain in 1964 . The aim was to interrupt white matter tracts between orbital cortex and subcortical structures by placing a lesion in the region of the substantia innominata just below the head of the caudate nucleus. In patients with depression and OCD, total improvement or improvement with minimal symptoms was clinically observed in two thirds of the patients. Patients with schizophrenia, personality disorder, drug abuse or alcohol abuse did poorly. Fulton was the first to suggest that the anterior cingulum would be an appropriate target for psychosurgical intervention and cingulotomy was initially carried out as an open procedure. Currently, the surgical indications are treatment refractory major affective disorder, chronic anxiety states or OCD. Initially these procedures were carried out with ventriculography but over the past several years this has been replaced by MRI guided stereotactic techniques. Lesions are created by thermocoagulation. Limbic leucotomy was introduced by Kelly in 1973 and combines subcaudate tractotomy with anterior cingulotomy. This procedure was designed to disconnect orbital-frontal-thalamic pathways with the former lesion and interrupt an important portion of Papez's circuit with the latter. Kelly et al reasoned that these two lesions might lead to a better result for the symptoms of OCD than either lesion alone. Indications for surgical intervention included obsessional neurosis, anxiety states, depression and a variety of other psychiatric diagnoses. This procedure is carried out stereotactically and three small lesion were placed in the lower medial quadrant of each frontal lobe and two lesions in each cingulate gyrus. Lesions were created using a either cryoprobe or thermocoagulation. Although Talairach was the first to describe anterior capsulotomy, Leksell popularized the procedure for patients with a variety of psychiatric disorders. The aim was to interrupt presumed fronto-thalamic connections in the anterior limb of the internal capsule where they pass between the head of the caudate nucleus and the putamen. Clinical indications for Capsulotomy initially included schizophrenia, depression, chronic anxiety states and obsessional neurosis. 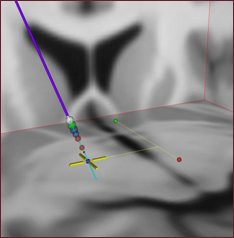 Lesions are created by Gamma knife technique . No evidence of cognitive dysfunction has been reported in 250 capsulotomy patients studied using a variety of psychometric tests. Anterior capsulotomy and cingulotomy, the preferred psychiatric procedure in the US, are established treatment modalities for some psychiatric disorders, in particular OCD. The results of Gammacapsulotomy for OCD are very encouraging with significant improvement in these very sick, sometimes suicidal, patients. The smallest collimator size, 4 mm, is used when creating small volumes of necrosis in central areas of the brain. 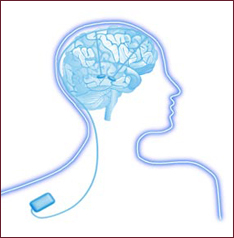 With this dosimetry, the risk is low of inducing a delayed reaction in the brain tissue adjacent to the target area. In people with OCD, the network of areas that communicate is always working, working, working. Medication and behavioral therapy can lower the activity of this brain circuitry. But some people don't respond, and I use the Gamma knife to try to cut the connection. Not really a knife at all, the Gamma Knife is a machine that emits powerful, highly focused gamma radiation beams. This helps the doctors target a specific area of the brain while sparing healthy surrounding tissue. It's used to treat people with Brain tumors, Parkinson's disease, and other neurological disorders. The Surgical treatment of psychiatric disease can be helpful in certain patients with severe, disabling and treatment refractory major affective disorders, obsessive compulsive disorder and chronic anxiety states. Psychosurgical treatment should only be carried out by an expert multidisciplinary team with experience in these disorders. Surgery should be considered as one part of an entire treatment plan and must be followed by an appropriate psychiatric rehabilitation program. Many patients are greatly improved after surgery and the complications or side effects are few. Surgical intervention ( Gamma Knife Surgery ) remains an important therapeutic option for disabling psychiatric disease and is probably underutilized.